You discover the pleasures of skating and share your passion with the flâneurs. Flaneurz values unify our community and our ambassadors. 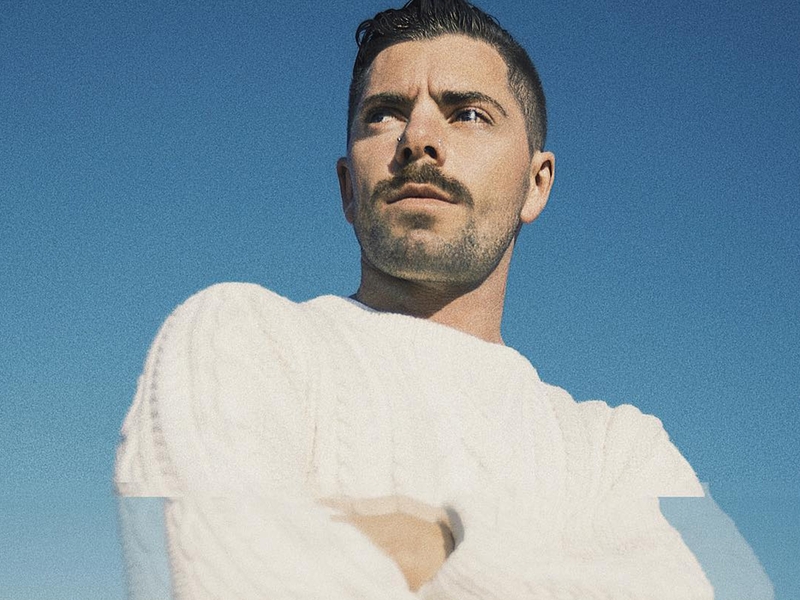 Anthony Finocchiaro, an iconic skater from the 2000s, has recently joined the Clique. Known for his career as a top-level athlete in the roller skate world and now living in Spain, he is ready and very motivated to take part in our innovative concept. During a Barcelona/Paris trip, "The Finch" came to Flaneurz SkateLab to answer our questions. /Tell us about yourself, what discipline(s) do you practice and how this passion for roller skating started? Everything started in a very unusual way. When I was 10, I asked my parents for a skateboard for Christmas. I dreamt of being able to go "riding" in the mythical " Bowl du Prado " in Marseille. But I've been very disappointed because they offered me a pair of quad skates! You must know that because I was so sad, I regularly exchanged my quad skates with skateboards. I became friends with people from the roller skating world. During our strolls, I discovered street skating. I understood that to follow them, had to keep my quad skates. So quickly, I embraced roller skating as a way of life and I haven't stopped since I was 10 years old. Now, I have 22 years of practice. In terms of disciplines, I started with aggressive skating, it means creating figures on modules or in the street with inline skates. However, I have been lucky to be trained by old skaters. They were riding quad skates, which allowed me to have no stereotypes about the different disciplines. At that time, people who practiced quad skates and inline skates were not friends at all. But for me it was not important, I am an open-minded person. For the story, I used to go to the skatepark on quad skates and I had my street pair in my backpack. So once I arrived at the bowl, I changed my pairs. Later, I practiced jumping, downhill and I even have a *buggy rollin suit. However, I am unable to slalom or to do roller dance. I'm not technically patient enough. To sum up, I am a fan of riding sports. I also do skateboard and do BMX Flat. I am curious and I am interested in all extreme practices. *Armor or combination with wheels at the different support points of the body. /Do you live from your hobby? How do you combine your skating practice in your daily life? Roller skating is an important part of my life, but it’s not my main activity. Only 6 months after my beginning in skating, I started competing in freestyle contests. Quickly, I got the reputation of a skating prodigy. Few kids could do what I did. Many brands from the skating world became interested and I was quickly sponsored. I participated at the FISE during my first year in the skate world and I finished in the top 10 beginners. When I was 25 years old, I stopped competing at a high level to devote myself to others projects. Ten years ago, I joined the Seba group as artistic director. I worked on the brand visual development: photos, videos, blog and social medias edition. I also took part in the development of their street product division. As I was the only one within the brand to come from this sector, I was able to share my expertise. We created a professional riders team and I have been a beta test rider, like Poupa with Flaneurz. Everyday, my skates are an extension of my body. In Barcelona, I never take the subway, I do everything by skating! I kept my usual practice of going to the skatepark on quad skates and with my pair of street in my bag. Sometimes I even jump straight into the bowl with my quad skates! /How did you know Flaneurz? What do you like about this concept? I discovered Flaneurz during their Kickstarter campaign. I am an urban traveler and such as the skate community, I was waiting for a concrete project that will change our practice. Since I started roller skating, I have been creating my own quad skates by fixing my sneakers on plates with Kryptonics wheels. I used a huge number of Nike Air Force One. For example, before I had my first Flaneurz pair, I used to make generally 4 homemade quad skates every year. Under the Barcelona sun, I can skate all year long. Also, I was surprised when I received my Fila Cage Socks pair. I was expecting soft shoes and a fragile system but in reality my ankle is well maintained and the system never broke. Once I got used to clipping/unclipping, I realized that I could jump my front home steps every day without any problem. Flaneurz represents the achievement of the roller skating practice, I don’t need anymore to keep two pairs with me. 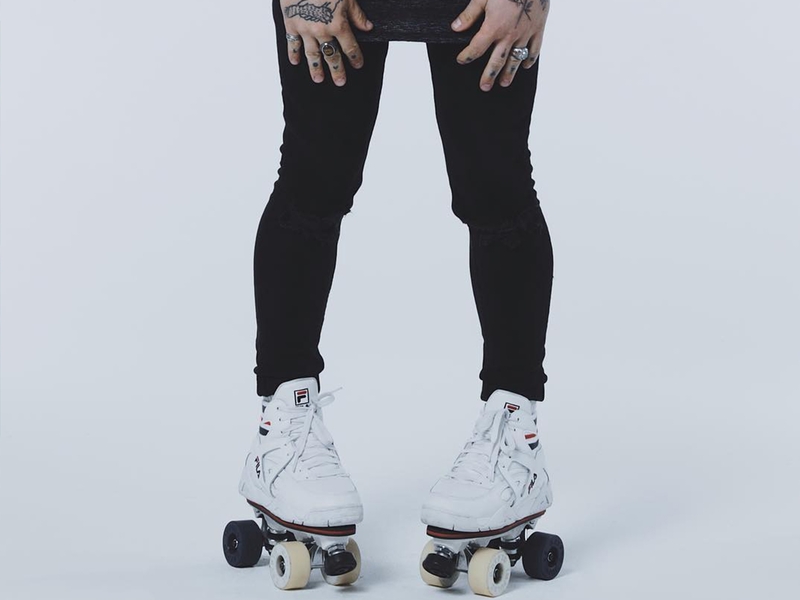 It's the perfect combination of roller skating with the shoe, it's the best of both worlds: being stylish with quad skates. /What does it mean for you to be a Flaneurz ambassador? First of all, being contacted by a brand to become an ambassador is a kind of acknowledgment. For me, Flaneurz has two aspects. 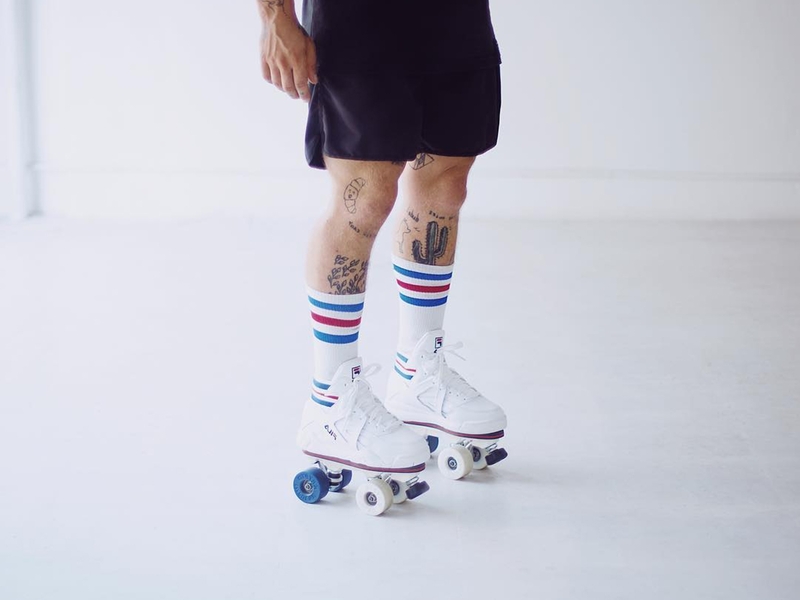 The first is to bring my vision as a user because I am a customer who is passionate about roller skating before being an ambassador. I use them everyday. I like to share my vision of this sport by explaining. It is a pleasure to stroll Flaneurz at my feet, and not a obligation. I feel invested because it is a product that attracts curiosity. When people stop me on the street, I love to show them the concept. I always have my key on me to clip off. I don't hesitate to let people try my own pair! The second aspect is the educative notion. To overcome the differences between all the disciplines in the skate world, I use my ability to communicate with my community on social media. In my opinion, it’s important to show the importance of the quad skates in the skate history. I like to promote the multidisciplinary nature of roller skating by breaking down rules. I must be an exemplary model to educate the roller community. There is a form of neutrality with Flaneurz: it is not a product created for one practice but for all skaters. Such as Anthony, do you want to promote the roller skating world with us? Follow us on social media (Facebook, Instagram and LinkedIn), subscribe to our newsletter and share Flaneurz with your loved ones! With Flaneurz, let yourself be carried away by the wind with chic and elegance.